Shelinta Perez is a native of Spring, Texas. She currently resides in Spring with her Supportive husband and four beautiful daughters. Shelinta has been in the education field for over 5 years but her love for teaching and helping children started well before becoming a teacher. She has always had a passion to help children through education and encouragement. Her belief that all children deserve a fair chance at life brought her to do volunteer work with Child’s Advocate in Houston, Texas. Shelinta later received her Bachelors’ Degree in Psychology with a focus in Child Development and Autism. She has experienced several roles under the Special Education Umbrella including Structured Learning and In-Class Support/ Resource Teacher. Shelinta is a dedicated teacher that stands firm on providing students with a quality educational experience. Her dedication and knowledge of what it takes to be an effective educator have not gone unnoticed. Shelinta received the honor of representing her campus as Rookie Teacher of the Year. Shelinta believes that all children deserve the opportunity to learn and achieve their potential on the level of instruction that will benefit their growth no matter the pace of their learning style. 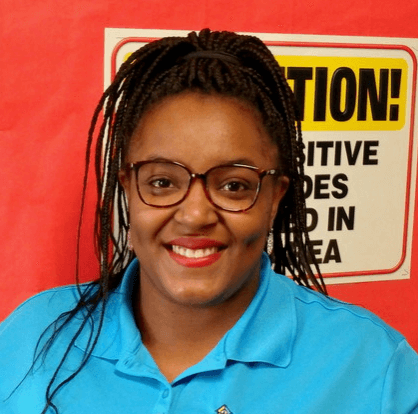 She makes sure that she creates a safe learning environment, sets high expectations and implements rigorous instruction that challenges her students.